Squared-off chromium-plated radiator grille with vertical slats and thick centre bar, atop of which is a growler badge. Matched pairs of twin headlights or rectangular single units dependent on model, with chromed surrounds. Rubber-faced full-width bumper bar incorporating sidelight and indicator lenses with reflectors within the wrap-around section and centrally mounted number plate area. Chrome-plated blade to top of bumper bar. Under-valance in body colour with black plastic air intake and spoiler. Design changed from 1992. Forward-hinged bonnet, quite flat in profile. Large bonded windscreen with chrome surround and centrally mounted single wiper. Wrap-around bumper treatment as at the front incorporating red reflector and red high intensity fog lights. Flat boot lid with pronounced lip and vertical panel incorporating number plate and badging. Chromed boot lock finisher with concealed number plate lighting and boot lock button. Rectangular rear lighting units at extremities of body, neutral density or more lenses dependent on model and age, some with chromed surrounds. Centre vertical boot lid section carrying make and model badges and centrally mounted number plate with chrome surround. Black plastic finisher between vertical portion of boot lid and rear valance. Twin exhaust pipes emit from either side of the car below bumper level through cut-outs in valance. Slightly more slab-sided styling to previous Jaguar XJ6 but retaining slight 'hump' over rear wheel-arch. Six-light window styling (rear quarter-lights separate to rear door frames). All cars featured a trim finisher at the base of the D-post roof section where it meets the rear wing, either chrome or body colour dependent on age of car. Side indicator repeater lights to top rear section of front wings (design changed from rectangular to square in 1991). Badges featured on US spec cars. Chromed or black powder coated window frames and B/C post dependent on model and year (see accompanying photographs). Chromed door mirrors and flush-mounted chromed door handles. Unusual metric-sized steel road wheels with grey plastic rimbellishers incorporating separate push-fit centre section to access wheel nuts and incorporating growler badges (changed to non-metric wheels and ventilated rimbellishers from 1991). Alloy wheels fitted as extra cost option initially, later standardised on some models. Type of wheel changed through production (see photographs). Two pairs of single circular headlights with chrome surrounds within a body-coloured mounting. Radiator grille with chromed slats and grey growler badge. Steel wheels with plastic rimbellishers as standard equipment. Black powder coated window frames. 'Jaguar' and 'XJ6' scripted badges on boot lid panel. Three different styles of indicator repeater lights were fitted to the front wings on European cars (not fitted to US spec models). The earliest rectangular type (see earlier pictures) was used until 1991, when this square type was adopted, only to be replaced on the very last cars by the inset flush style. Single rectangular sealed beam headlight units with chromed surrounds. Chromed window frames. Early cars fitted with steel wheels and rimbellishers, later fitted with metric-sized teardrop alloy wheels with exposed wheel nuts, also an option on early cars at extra cost. Later cars also used different alloy wheel styles (see photographs and production details). 'Jaguar' and 'Sovereign' badges in rectangular brushed alloy finished format. Very early Sovereign examples fitted with matt black painted vertical cover to boot lid fitted underneath badges and number plate surround. With the introduction of 4.0-litre models greater use of chrome at rear of car (see photographs for details). Fluted radiator grille surround with 'D' emblem badge at centre top. Lights and window surrounds as Sovereign. Scripted 'D' badging to alloy wheels. Design changed to Roulette style from 1991. Slim full body-length swage line chrome trims. Vertical boot lid panel matt black finished as earlier Sovereigns (later dropped) but incorporating 'Daimler' scripted badge to left-hand side. Low density rear light units recognisable from dark grey finish instead of red. 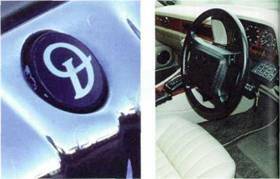 With introduction of Daimler Double Six model in 1993 revised multi-vane alloy wheels fitted and 'Double Six' scripted badging added to rear boot area. Above left: A simple V emblem on the fluted radiator grille and Daimler badging at the rear separated European cars from the US Vanden Plas models. Above right: Revised interior layout from 1990, with the analogue instruments and here, in this 1992 model, the new steering wheel with air bag. As XJ6 except fitted with ventilated silver-painted rimbellishers on new 15in steel wheels (standard equipment, alloys optional). Frontal treatment with four headlights as XJ6 except for black centre grille vanes and gold growler badge on top. Wider profile tyres fitted with 16in lattice alloy wheels. Initially chromed plated window surrounds, later changed to black powder coated. 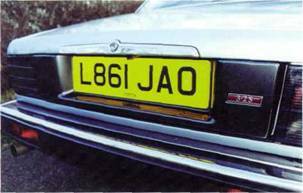 At rear chromed surrounds to rear light units and boot lid, with 'XJ12' rectangular brushed alloy style badging to right-hand side. For the Jaguar XJ 12 came a revised grille with painted slats and gold growler Badge, and tour headlight treatment. The Daimler Double Six version retained a chrome grille and rectangular headlights. Until the end of 1993 chromed window surrounds also featured on the XJ12, but were then changed to black powder coating. As XJ6 except for body-coloured centre vanes to radiator grille. Five-spoke alloy wheels (silver or eggshell finished) with wider profile tyres. Twin coachlines with 'S' logo to lower half of body sides accompanied by single gold coachline along swage. At the rear plastic in-fill panel to boot vertical area incorporating '3.2 S' or '4.0 S' badging. 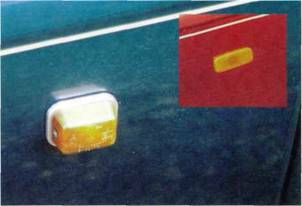 Contrast density rear light units fitted without chromed surrounds of later cars. The S (Sport) model was introduced for the 1994 model year. This was identilied from the outside by its five-spoke alloy wheels in either eggshell or silver finish, red growler badges to the wheels, painted radiator grille slats, and revised coachlines. 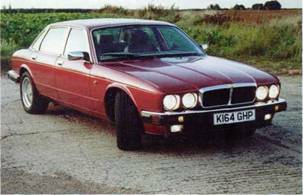 As with the XJ-S the JaguarSport organisation adapted production XJ40s for a more youthful market. 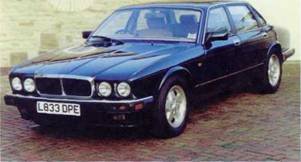 Called the XJR, these initially featured similar body treatment to the XJ-S models, later to be adapted for normal Jaguar production with a revised grille design as shown here. At the rear the S model gained a painted plinth with new Badging, and a choice of colour density for rear light units. As XJ6 except for gold growler badge on grille top and black centre vanes. Kiwi diamond-turned alloy wheels. Twin gold coachlines along entire length of swage line. At the rear 'Gold' badging against a black rectangular background. Another new model for 1994 was the Gold with a limited range of exterior colours, new diamond-turned alloy wheels, and painted grille slats. At the rear the Gold model featured new badging and the S style plinth. 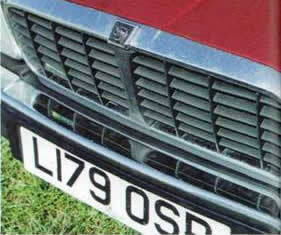 As XJ6 except for matt black centre grille vanes (later changed to egg-crate style). Colour-keyed front and rear bumper bars. Revised front under-valance and spoiler treatment. Initially XJ6 style four headlight treatment, replaced, when egg-crate grille came in, with rectangular lights from Sovereign model. Flat design Speedline alloy wheels, later changed for ventilated type with exposed wheel nuts. Glass fibre sill extensions sculptured and in body colour. Later egg-crate grille cars featured rubbing strips along lower section of body sides. Chromed window surrounds or colour keyed. At the rear revised under-valance. Plastic in-fill panel to vertical section of boot and 'XJR' badging. 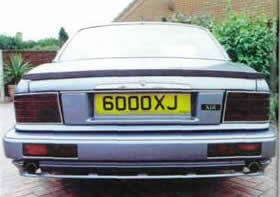 The XJR came with a bodykit and rear plinth arrangement as well. 1: Alter the earlier plastic wheel covers (see the 2.9-litre car on page 165) this style ot plastic wheel cover was adopted from 1991. 2: This style of plastic wheel cover then took over in 1992. 3: and 4: Two styles of teardrop alloy wheels were fitted to the XJ40 models, one metric size. 5: Lattice style wheels adopted for sport handling kit-modified cars, XJ12s, and later most 1990 Sovereign models. 6: Five-spoke wheels for the S model, later available for other models and XJS as well. 7: and 8: Later styles of alloy wheels fitted to Sovereign models, and others as optional. 9: Multi-spoke, as fitted to the Daimler Double Six models. 10: Roulette style wheel normally fitted to 4.0-litre Daimler models but also offered for other cars. 11: and 12: Early Speedline and later Sport wheels fitted to XJR models, the latter also being used for late model XJS cars.